Stretching 1,247 feet (380m) across the Colorado River, the Hoover Dam holds back the waters of Lake Mead and is a fine example of the engineering of its time. One of the world's most famous dams, the Hoover Dam was built during the Great Depression in the 1930s - one of many vast public works projects commissioned by the US government to get people back to work. The dam employed thousands of men from all over the country, and its hydroelectric power generator continues to supply Nevada and its neighbouring states with electricity. Engineering feats aside, the Lake Mead National Recreation Area is popular with water sports enthusiasts as well as those just after a bit of sun and relaxation. 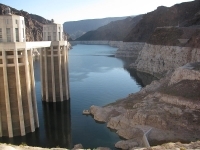 Transport: The Hoover Dam is an hour's drive from Las Vegas. Coach tours can be arranged through most hotels and tour operators.